Readers of this blog are likely aware of the existence of a reader’s Hebrew Bible and a reader’s Greek New Testament. 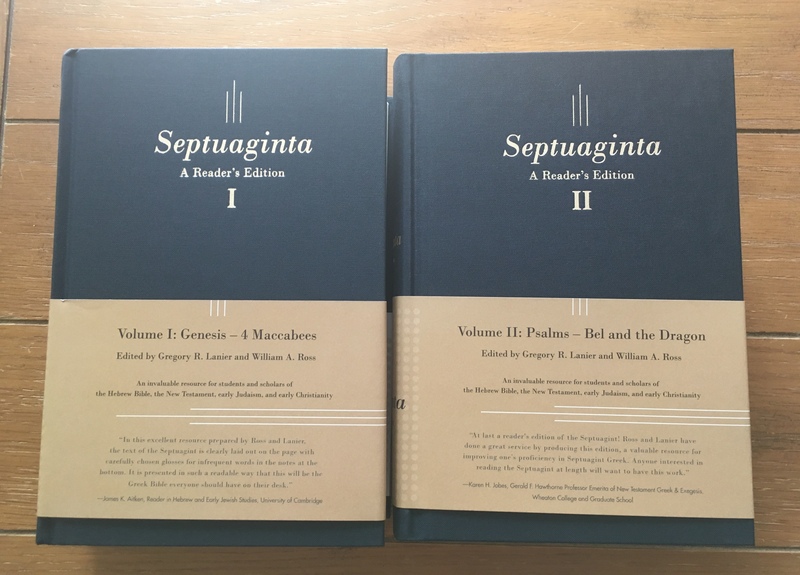 I have pined for a reader’s edition of the Septuagint, and now it exists. Mine arrived in the mail today. It’s heavy, beautiful, and awesome. What light through yonder Bible breaks? 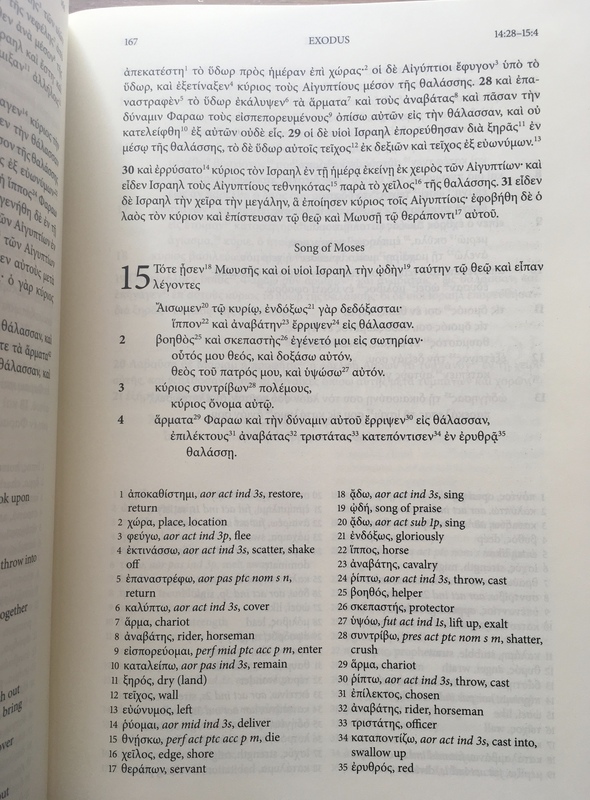 In order to facilitate natural and seamless reading of the text, every word occurring 100 times or fewer in the Rahlfs-Hanhart text (excluding proper names)—as well as every word that occurs more than 100 times in the Rahlfs-Hanhart text but fewer than 30 times in the Greek New Testament—is accompanied by a footnote that provides a contextual gloss for the word and (for verbs only) full parsing. For everything else there is a Glossary at the back of each volume. 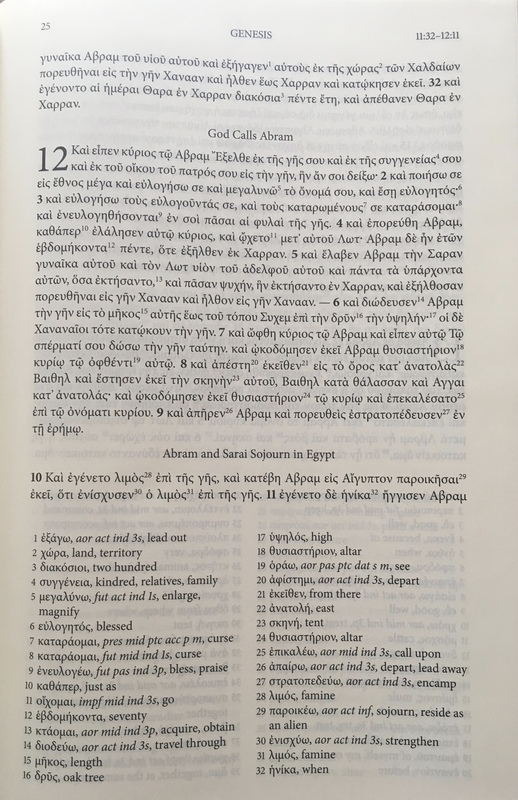 Everything is beautifully typeset–much better-looking than the Rahlfs-Hanhart Septuagint text (all due respect to that typesetter!). The font is aesthetically pleasing and easy to read. The pages are cream-colored (which looks great) and not at all the wispy-thin Bible paper I was expecting. AND the binding is sewn. 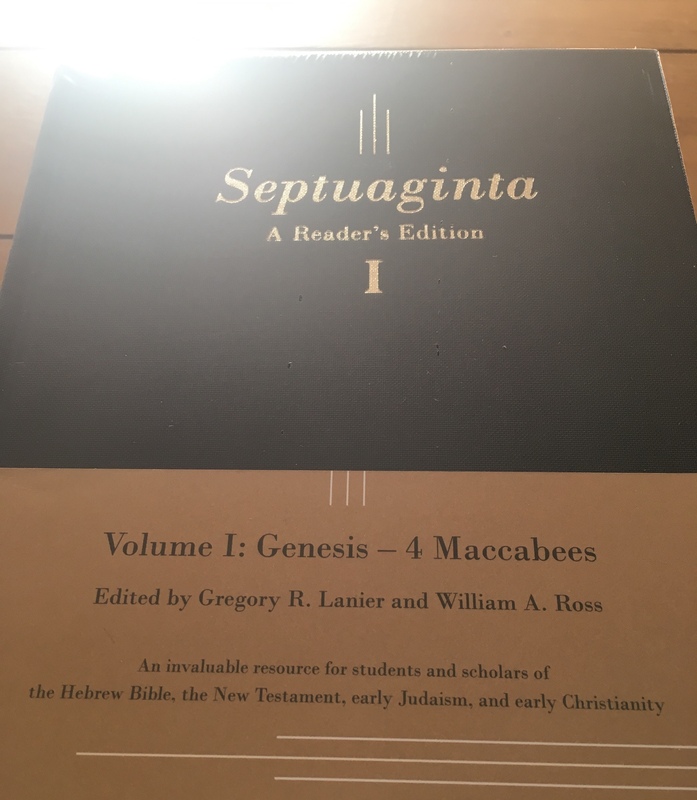 This Septuagint will last a lifetime. What does the text itself look like, you wonder? I can’t begin to express my gratitude for the work Lanier, Ross, and others put in to this project. A major desideratum of Greek reading and Septuagint studies is finally here, and so far, it has far exceeded my expectations. A full review is coming later. For now, check out this masterpiece here at CBD, where it is available for a totally-worth-it sale price. Thanks to the awesome people at Hendrickson for the review copy, sent to me with no expectation as to the content of this review. Will do! Thanks again for all you’ve done to make this project a reality. Wish I could be at ETS/SBL/AAR to get more of an inside look at the process! Hey Abram. Thanks for your review. I’m really interested in getting his. I’m almost finished with my M.A. 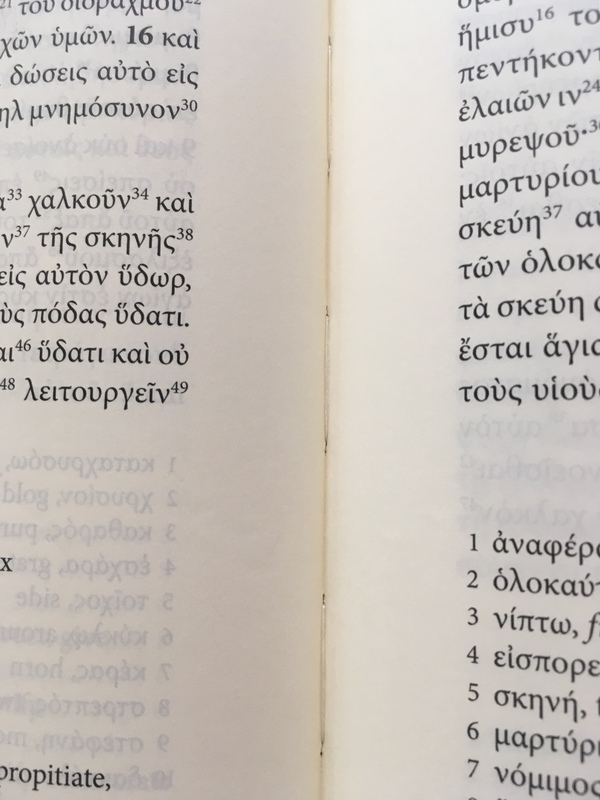 at SBTS, and, in your personal opinion, are some of the best things I can do to get into the Hebrew and Greek texts (I’ve had both languages here, so I already know the basics). I know simply reading the text is a big one, but do you have any other tips? Thanks much. Hi, Spencer–my pleasure. Glad you found it helpful. Reading the text, especially with a reader’s Bible (not an interlinear or diglot, although I suppose those have a place) is good. Also would recommend listening to GNT or Hebrew Bible on audio. 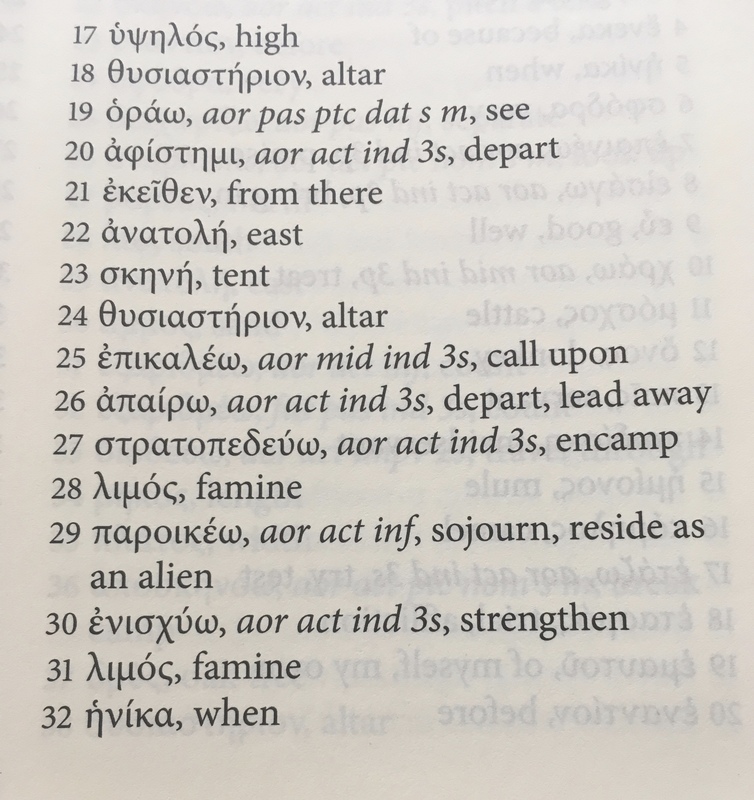 Reading out loud with others is the best thing I’ve ever done to improve my Greek… been a while since I’ve been able to do that, though! Also, writing out a verse a week and memorizing it will help with morphology. 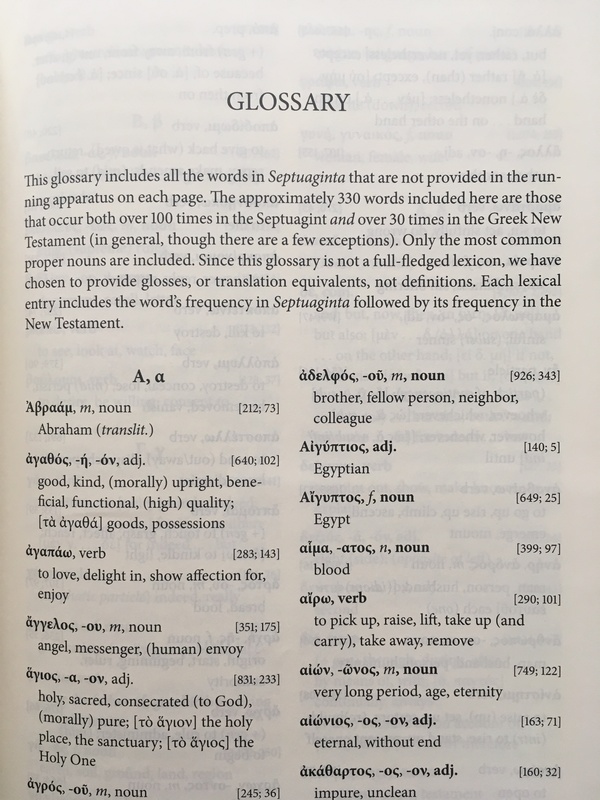 Pingback: One Year Graded Septuagint Reading Plan | Septuaginta &c.